If you set your camera to any of the "automatic" modes ("Auto", "P", "A" (or "Av") or "S" (or "Tv"), your camera tries to set the aperture, shutter or both (depending on the mode) for you so the picture comes out properly exposed. It usually does a pretty good job of this. (For more info on these modes, see this eTip). 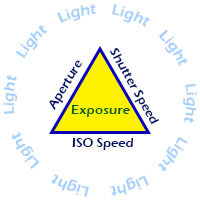 showing the 3 components of exposure. What's wrong with AUTO mode? If you are shooting in "Auto" mode, you might as well be shooting with a $20 camera. "Program Mode" is better than "Auto"
If you shoot in "P" (Program mode), your camera will still decide most things, but this mode gives you more control than "Auto" mode. In "P" (Program) mode, you can use a feature called "Flexible Program" (Canon) or "Program Shift" (Nikon). Flexible Program or Program Shift lets you change your aperture and shutter speed while the camera maintains the proper exposure. Most cameras work the same way – once in program mode, with the exposure system on (you generally just need to press the shutter button half-way to turn it on), you just turn a dial (usually the "main" dial, if your camera has more than one dial). As you turn the dial, you can view the changing aperture and shutter speed in the viewfinder, or LCD display. Turning the dial doesn’t change the exposure, it just selects one of multiple equivalent exposures. It does this by changing the aperture and shutter an equivalent amount. (e.g., 15 = 1/15 second shutter speed). Each of the round dots on the graph along a single diagonal line indicates an equivalent exposure. Each of these exposures is exactly the same – that is, each will let exactly the same amount of light to reach your camera’s sensor. By going from f8 to f11, the aperture is allowing 1/2 of the light to reach the sensor, but by going from 1/200 second to 1/100 second, the shutter allows twice the light to reach the sensor – thus the same amount of light reaches the sensor. The main reason for doing this, is you may want to use a wider lens aperture to provide a blurred background, or you may want to use a smaller aperture to provide a sharper background. Changing the aperture changes the depth of field, which allows you to determine how sharp you want a background to be. Or, you may be shooting a soccer game, and you need a faster shutter speed to stop the action. Shooting in "P" mode, allows you to decide, once the camera sets the exposure, what aperture or shutter speed you want to use. You may not always want to change it, but you can if you want to. You could always shoot in "A" (or "Av") mode (aperture priority) to give you more control over your aperture. This is what I almost always shoot in, but, shooting in "P" mode can give you the similar control and can be a first step to leaving "Auto" mode. The main difference is in "A" mode, you only need to set your aperture once – in "P" mode, each time you take a picture, you’ll need to adjust your camera’s dial in order to change the aperture or shutter. 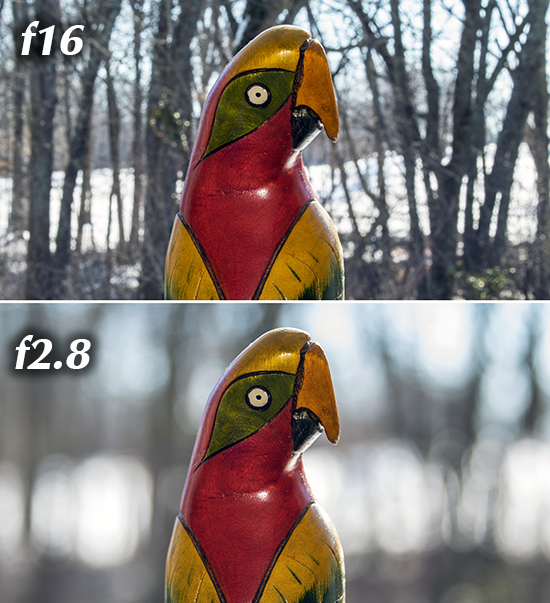 The image below shows the difference the aperture can make in how the background looks. These images were taken with a 70mm focal length (full-frame). I focussed on the wooden-parrot and you can see how changing the aperture had a profound effect on how sharp the backtround is, but little to no effect on the subject. Having control over the aperture provides a huge amount of creativity control - it's one of the most important aspects of taking good images. There are limits to how far you can adjust the aperture. Your lens aperture has a "maximum" aperture – usually f2.8, f4.0 or f5.6. So, you can’t go beyond that. Some lenses have a variable aperture. When zoomed to wide-angle, they have one maximum f-stop; when zoomed to telephoto, they have a different maximum f-stop (always smaller). The other limit is that you could select a small lens opening (e.g., f16) which would cause your shutter speed to be so slow, that you wouldn’t be able to hand-hold your camera without blurring the picture. So, you need to watch the shutter speed to make sure it’s not too slow. 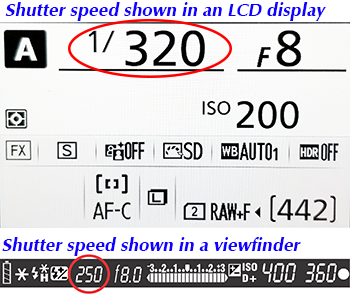 You can usually view the shutter speed in the viewfinder and/or LCD display (if your camera has one). Raising the ISO speed can help avoid a shutter speed that's too slow. The ISO speed on every digital camera determines how sensitive to light the camera’s sensor is. The higher the ISO speed, the more sensitive the sensor is, thus, less light is needed for a good exposure. If you are shooting in low-light conditions, you’ll want a higher ISO speed; on a sunny day, you’ll want a lower ISO speed. Lower ISO speeds yield better quality images, but sometimes you need to increase the ISO speed to get a good exposure. Digital cameras have a feature called "Auto ISO" – this feature will increase the ISO speed as the camera thinks is necessary for you to get a good exposure. If you don’t want to have to fuss with the ISO speed, "Auto ISO" is a good option for you. For more information on ISO speeds, see these eTips: ISO Speed - When to Change it. Understanding the components of exposure (aperture size, shutter speed and ISO speed) is critical to getting great images. You can't learn everything in one day - it takes time and a bit of effort on your part. Learning a little at a time is the best way to do this. If you are an "Auto" shooter, start by migrating to "P" (Program) mode and start using the Program Shift/Flexible Program feature of your camera. It's a great start to leaning how to be creative with your camera. Fantastic quality combined with a great price makes this your best choice in an industry-standard ball head. Bluetooth Remote Shutter Release for Smartphones is the ultimate selfie-tool. This tiny device fits easily on a key chain, so you can always..